Crispin Porter And Bogusky case studies: we currently have 1. 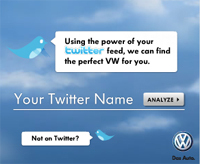 VW capture the moment by aligning their brands with the Twitter messaging tool. Using Twitter in the advert creates interest and helps VW stand out from other motor manufacturers. By typing in your Twitter name it then looks for your tweets and claims to be finding the right car for you based on your content. Behind the scenes it seems to pull language from your Twitter feed and display this within the advert. It’s a neat way of dipping into Twitter, but the real benefit here is threefold: engagement with the customer, creating the spark of talkability about the brand, and VW’s alignment with the funky microblogging platform tech trendsetters have gravitated towards.